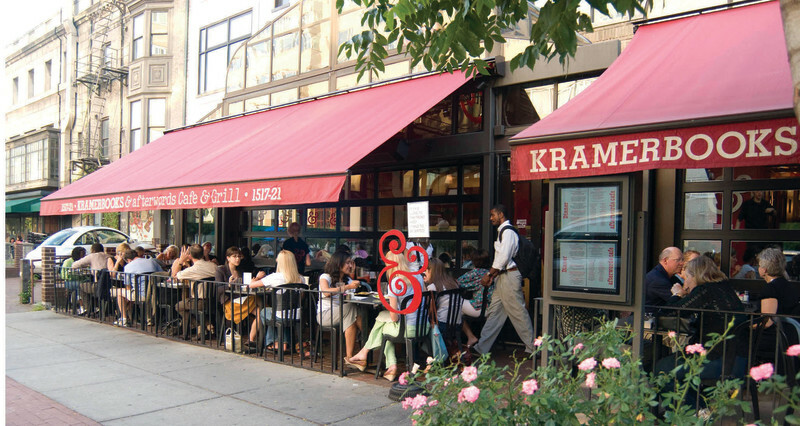 Washington's only full-service restaurant and complete bar combined with an independent bookstore, Kramerbooks & Afterwords Cafe is located at the Dupont Metro, Q Street exit. It is open early and late seven days a week, and 24 hours on Fridays and Saturdays. The restaurant offers breakfast, lunch, dinner and weekend brunch, as well as a distinguished selection of beers and wines, cocktails, coffee drinks, ice cream drinks and fabulous desserts. The full, widely varied dinner menu is available until closing time. Between the solarium and the sidewalk cafe, open-air dining is offered rain or shine, year 'round. A unique, independent local business, Kramerbooks & Afterwords Cafe has been a favorite with locals and travelers alike since opening in 1976.